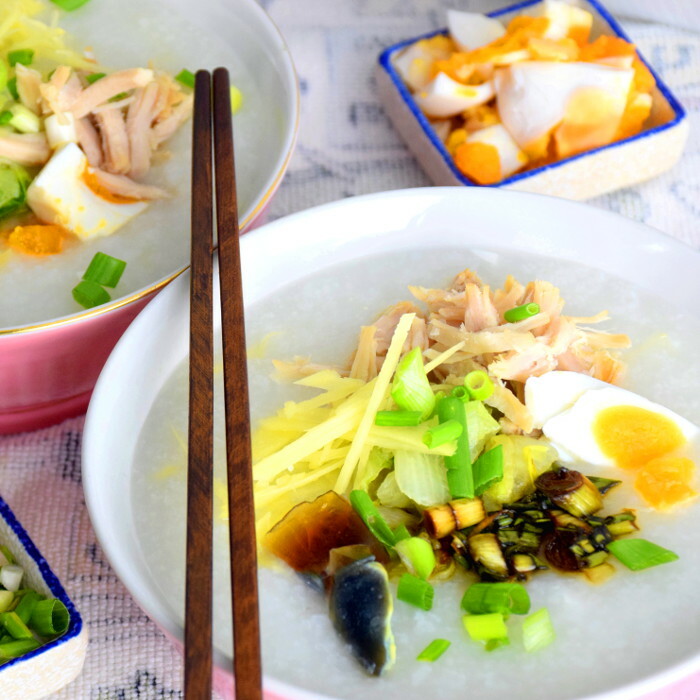 This Chinese porridge recipe is one of the most comforting breakfast favorites among the Chinese. 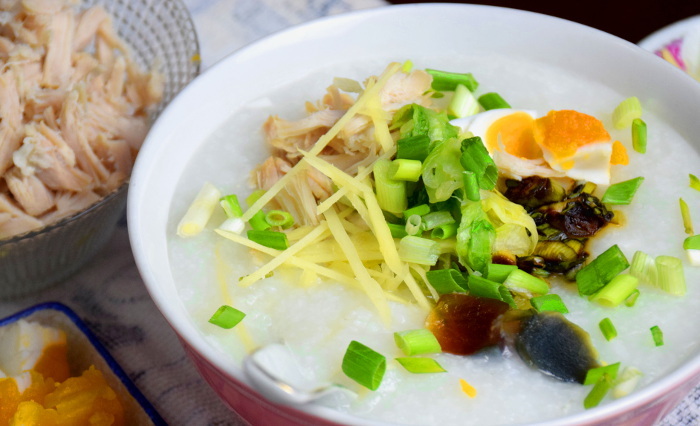 The porridge (congee) is called the Lean Pork and Century Eggs Porridge (皮蛋瘦肉粥). Many people think that the only way to get the velvety smooth porridge is to simmer the porridge for long hours. In this porridge recipe, I’ll describe the method of getting this texture in half the time. A steaming bowl of Chinese porridge (or Jook if translated phonetically) works magic to alleviate the sniffles or just fill a belly. Chinese porridge is the go-to food when someone falls sick and is on a liquid diet. It is delicious, easy to digest and versatile for adding ingredients. It becomes a complete one-pot meal when vegetables are stirred into the meat porridge. 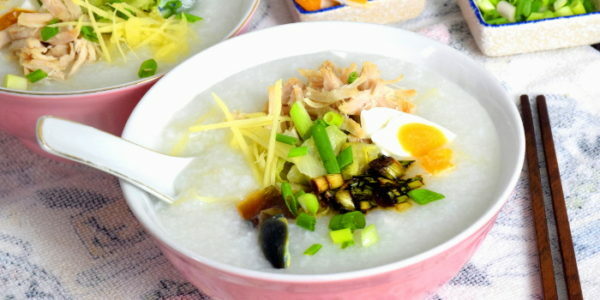 Note: If you come across any Chinese congee recipe, it is just another name of Chinese porridge recipe! Do you want to make a fantastic pot of porridge? No problem. Please read this tips and tricks before printing out the porridge recipe. (The recipe is just right after the tips.). This cooking note was written while I cooked, test, plus my observation of how my mom did it (mother's cooking is always the best 🙂 ), and information from books, videos, and articles. 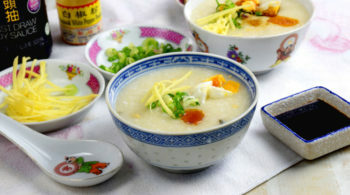 Cantonese porridge is famous for its silky texture. Traditionally, it takes more than an hour of simmering to get the desired texture. Fortunately, you can freeze the rice before simmering to speed up the process. Add some salt and oil to the rice and leave it for half an hour. Rinse the rice with water twice. Add the rice to boiling water and proceed to cook the porridge. Soak the rice, adding salt and oil help to soften the rice grain. This step will shorten the duration to cook the rice until it becomes silky and homogeneous. In this porridge recipe, we have shortened the time by half by using the freezing method. Rinse the rice with water twice. Drained. Add some salt and oil to the rice. 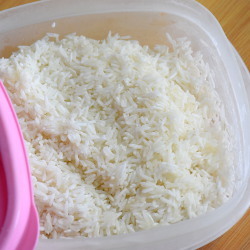 Freeze the rice overnight or at least until it is frozen. The next day, add the frozen rice to boiling water and proceed to cook the porridge. When the rice is frozen, the water within the rice grains will turn into ice. Since the volume of ice is ten percent larger than water, it will alter the structure of the rice grain. As a result, the rice grain will easily be broken down into smaller pieces after freezing. Therefore, the total surface of the rice grains increases drastically, and the starch will break down much faster, thereby reduce the time required to achieve the velvety texture. Rinse the rice only twice Why? We are used to rinsing the rice repeatedly until the water runs clear before steaming the rice. But why is it only need to rinse twice in this porridge recipe? 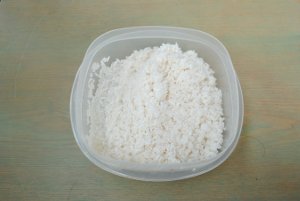 Reason: Rinsing the rice twice is to remove the impurities. Further rinsing will remove the starch which is essential to form velvety smooth porridge. You can use long or short grain rice to make porridge. Short grain rice will produce thicker porridge due to the higher content of starch. 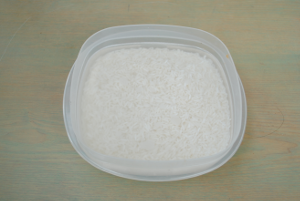 You need to use more water or reduce the amount of rice if short grain rice is used. The water to rice ratio is the key to cooking a perfect pot of Chinese porridge. The ratio of water to rice I use in this recipe is 15:1. This amount of water is sufficient to cook the porridge until the rice grains disintegrate forming a silky smooth sludge. However, the actual amount of water depends on the heat of the stove, the amount of porridge in the pot and whether the rice is frozen. Use more water if you are unsure. If it is insufficient water, you can add water to it, but it has to be boiling water. Adding cold water tends to cause the porridge separate into two layers, much like oil separates from water in mayonnaise. The choice of ingredients differs from one Chinese porridge recipe from another. You can use any ingredients to the silky smooth porridge base. 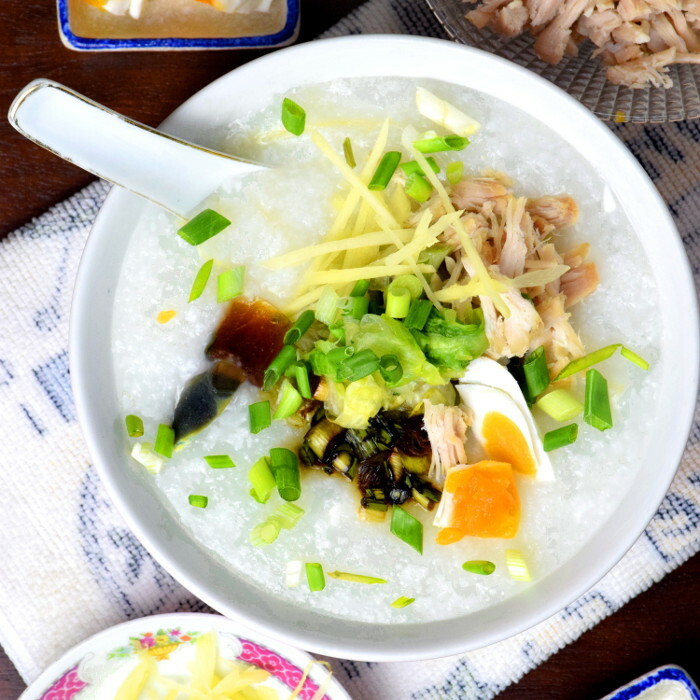 Pork and Century eggs (also called thousand year eggs) are used in this famous Cantonese porridge recipe, but you can substitute it with chicken, ground beef, fish fillet, prawns, and other seafood. You can also substitute the shredded lean pork with the leftovers from the Thanksgiving turkey. If you do so, add the cooked turkey meat to the porridge after the porridge is done. You can boil the turkey meat for a few seconds to heat it up or just serve it on top of the porridge in a bowl. Other porridge recipes may include dry scallops as part of the seafood in the porridge, thinly sliced beef, beef balls, peanuts and mashed pumpkin. Pork loin is the favorite cut to make this porridge. Marinate with salt and vegetable oil overnight (or at least half a day) in the refrigerator. 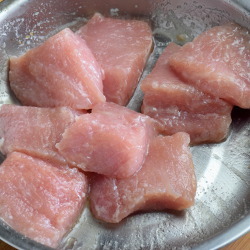 Blanch the pork in boiling water for one minute to remove blood and impurities.. Drained. Cook together with the rice until the porridge is done. Don't worry about too much salt in the marinade. The excess salt will be washed off during blanching. Cut the meat into large chunks because we want to boil it together with the rice. I agree century eggs are gross for some people. They look weird, smell awful, and bring to mind the mutated baby Godzillas. They have other names which I do not know how they are derived: hundred-year eggs, thousand-year eggs, millennium eggs, but in fact they are preserved eggs. The century eggs are traditional Chinese delicacy. 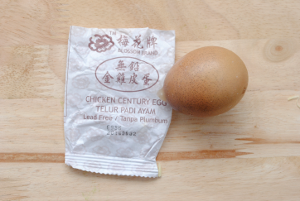 The chicken or duck eggs are preserved in a mixture of clay, ash, salt, quicklime for 15 to 20 days. Over time, the color of the yolk becomes dark green with a creamy consistency and strong flavor due to the hydrogen sulfide and ammonia present, while the egg white turns to a dark brown, translucent jelly with a salty flavor. Weird? You will never know the taste if you never try it. It will be a pleasant surprise for you. Cut the eggs carefully into small pieces. Be gentle as it is quite soft. Add half of them to the porridge at the early stage of cooking. Add the remainder at the final five minutes so that they will remain well-defined pieces after cooking. 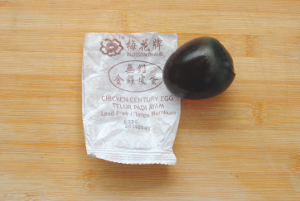 Century egg is alkaline, which helps the rice disintegrate quickly. They will eventually dissolve completely into the porridge if you cut them into very small pieces. That is why you should reserve some to add at the last minutes so that they remain as the whole piece when serve. By now your may understand why the porridge is so delicious. It is more than just pork and century eggs in the porridge recipe. 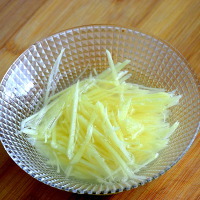 - Cut the ginger into fine julienne. - Use half of it to cook the porridge. - Soak the other half in water to reduce its strong flavor. Place it on top of the porridge as accompaniment. 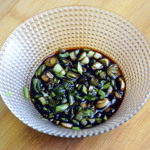 - Cut the scallion into small pieces. - Marinate with light soy sauce. 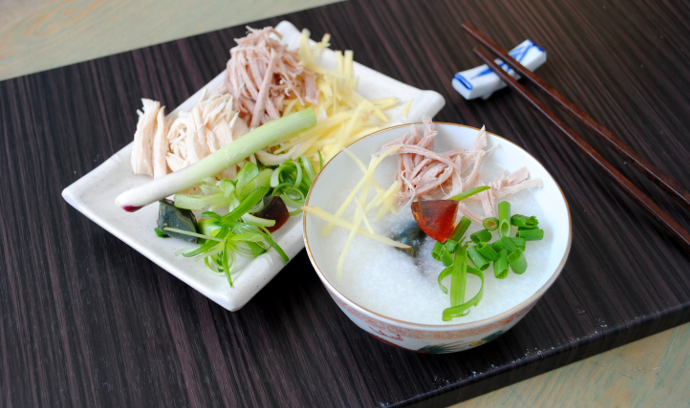 - Scoop a teaspoon of the marinated scallion on the porridge to serve. 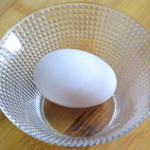 - clean the salted eggs thoroughly. - Place the raw eggs in the porridge and simmer together. (Much like making a hard-boiled egg). - Remove from the simmering porridge. Crack the eggs and cut into small pieces. - Return half of the egg pieces to the porridge and continue cooking. - Keep the remainder as the accompaniment to serve. - Cut the lettuce into strips. - Mix with salt, place it in a colander or strainer for 30 minutes. - Drained and squeezed dry the lettuce. - Place some lettuce at the bottom of the bowl. Pour the boiling porridge over it and serve. This step is to remove the raw taste and excess water that affect the flavor of the porridge. - Boil the porridge with the traditional method if you do not have time constraints. The longer you cook, the silkier the texture will be. - Use high heat initially to break up the rice grains rapidly. - Reduce to a bare simmer, like preparing a stew. High heat can toughen the meat. - Stir the porridge occasionally, as the porridge can stick to the bottom of the pot. 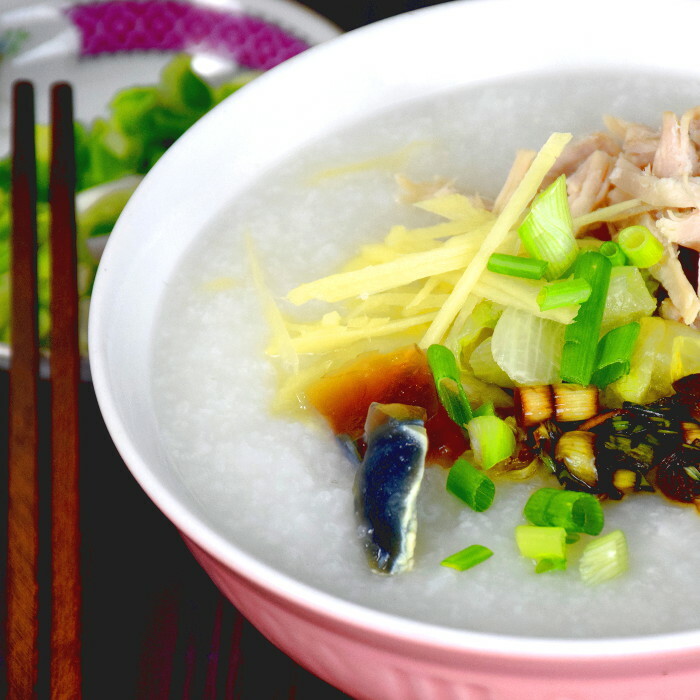 A drizzle of soy sauce and a few drops of sesame oil on the hot porridge make it an endless bowl of comfort. 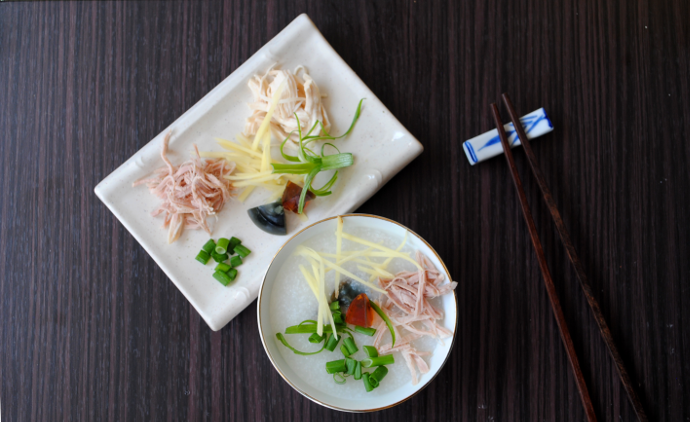 Garnish the porridge with the shredded pork, marinated spring onions, Century eggs. salted eggs, some shredded ginger, and freshly chopped scallions. 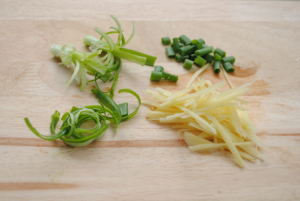 Check out this video- how to cut the scallion to garnish the porridge. 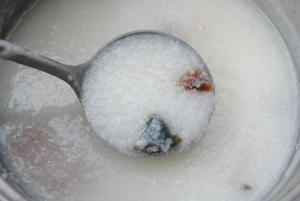 This freezing method can cut down the preparation time of porridge tremendously. Rinse the rice with water twice. Soak the rice with water for three hours. Remove excess water. Mix the rice with two teaspoons of vegetable oil and one teaspoon of oil. Put it in a container and store it in the freezer overnight. 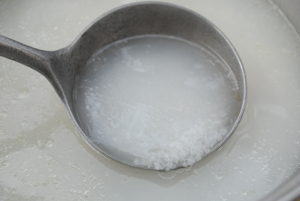 The oil helps to achieve a silky texture of the porridge. Marinate the pork loin. Put it in a ziplock bag or plastic container and keep it in the chiller for 12 hours. Rinse the excess salt on the surface of the meat. Blanch the meat for a few seconds in boiling water to remove impurities and blood. Cut the porridge into strips. Add a teaspoon of salt to it and mix well. Drained away the water by placing it in a colander. Squeeze the lettuce to remove any excess water. 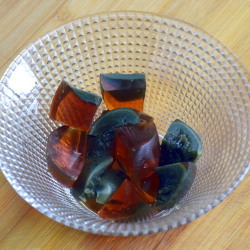 Cut the century egg into small pieces. Cut the hard-boiled salted egg into small pieces. Cut the ginger into fine julienne. Cut the scallion into 2-3 mm short sections. Marinate with some light soy sauce. Fill a pot with 3.6 liters of water. Bring it to boil. Add the marinated pork (after blanching) to the porridge. Add the frozen rice into the boiling water over high heat. Keep the water boiling vigorously and stir continuously for about ten minutes. Add half of the ginger, century egg, and the salted egg pieces. Reduce to low heat and simmer until the rice grains breaking up and the texture of the porridge becomes smooth and silky. Remove the pork. Shred the pork into small pieces. Place the lettuce at the bottom of the bowl. Ladle the boiling porridge over the lettuce. 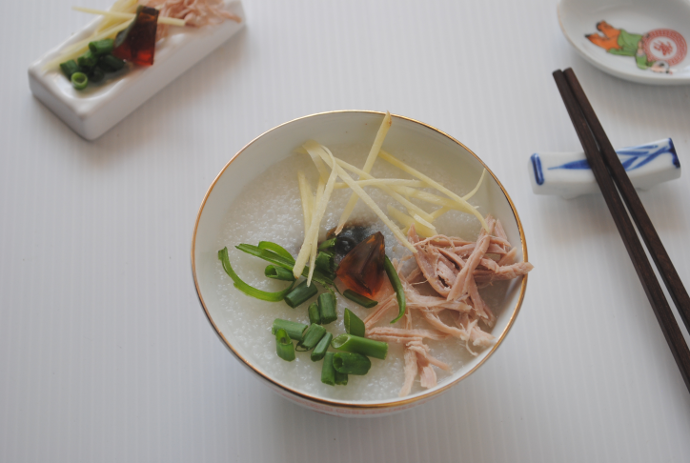 Place the shredded pork, ginger, marinated scallion, salted egg, century egg on the porridge. 13 replies to "Chinese Porridge Recipe – With Lean Pork and Century Eggs (皮蛋瘦肉粥)"
Thanks so much, Mr Kwan. I learned a lot from your recipe. I have a question..why oil is used before the rice is freezed? Thanks. As I mentioned in the recipe, the oil helps to achieve the silky texture of the congee. However, this is what I have done so far. I would be interested to find out whether this is necessary by doing a comparison test. Thanks for asking, which trigger me to do further digging into the technique. Last night, I made this dish according to your instruction and my hubby said its the best home cooked Chinese congee. Myself and Malaysian in 40’s and my hubby in his 50’s both residing in Singapore especially my hubby, he has enjoyed local dishes when S’pore food was in its pinnacle of excellence in the 70’s and 80’s, rare few still holding on towards mid 90’s but since then, the taste has gone downhill eversince. Those “Sifu” kept the “secret concoction” in lock and key and took it to their graves without imparting to anyone. Every wonder at present times why Hokkien Mee, Yau Char Kwai or Mee Rebus is always lack of something these days despite every stall has tried their best? Back to your recipe of Cantonese Congee. I really appreciate your time & efforts take to list down the ingredients and meticulously gave instruction to tackle the steps and methods of preparing the key ingredients like the rice processed into smooth and silky and marinating the pork. Its a shame that cook books that I purchased in local bookstores and shopping centres don’t even measure up to what you have given for free in the internet! And for this, please accept my 45 degree bow gesture of thanks and appreciation to you. Thank you, thank you and thank you! Btw, my hubby has asked me to prepare this dish again tonight. All thanks to you, our evening dinner is very enjoyable. I hereby, say my thanks to you again, terima kasih. Thanks for your compliments, and certainly feel flattered by your kind words. There are many excellent cookbooks that you can get in the bookshop of online. Perhaps you have unfortunately picked the wrong book with inferior quality. I am glad you have succeeded in making the porridge, and in particular, enjoy by the members of your family. My next recipe/article will be in the same direction, to give as much detail as possible, with the aim to deliver all I can with words and video to make it possible for everyone to replicate the recipe. Your comment pushes me further to the edge of the limit providing the quality recipes on my blog each time. Complete recipes. Good informastion about chinese porridge. I appreciate the traditional method that you shared. My question is, what if after we have done the initial steps of washing, soaking and even freezing the rice, could we use a slowcooker to prepare the congee and the pork? That is one thing that I am not entirely sure since I do not use a slow cooker. Cold rice from the freezer may take time to cook in the slow cooker. If you want to try that, please remove the rice from the freezer in advance. Other than that, there is a high chance to work out well, albeit you need some extra cooking time.